Given the barren two-and-a-half years at Naturena, Amakhosi could do with some recruits that will turn their fortunes around in the second half of the 2017/18 season as the January transfer window approaches. The likes of Itumeleng Khune, Willard Katsande and Siphiwe Tshabalala have been invaluable for Steve Komphela in recent times; however, the same cannot be said for the rest of the squad who have lacked consistency. 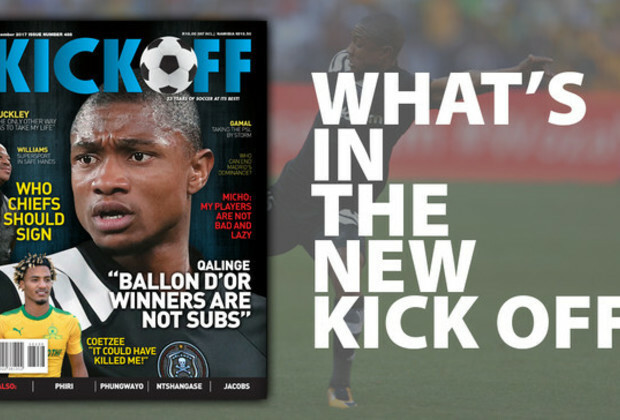 In the latest edition of KICK OFF Magzine (Issue 488), we identified players that Chiefs could look to in order to beef up their squad with both quality and experience. At the back, Bidvest Wits skipper Thulani Hlatshwayo has been touted as a central defensive option that can bring the much-needed leadership that was lost following the departure of Tefu Mashamaite. "'Tyson' leads from the front, irrespective of whether he is a captain or not. He brings aerial and physical dominance to the defence, is a good team player and brings a disciplined approach to his game," Hlatshwayo's mentor Mike Ntombela says on Page 9. In midfield, Chiefs could do with someone to compete with central defensive hardman Willard Katsande – someone who is just as industrious, offers vast experience but can also offer a bit more in attack. "Competition and depth is always good, and that's something that Chiefs need. They could do with someone of [Andile] Jali's quality," adds former Glamour Boys midfielder Stanton 'Stiga' Fredericks on Page 10. The value of Sundowns attacker Themba Zwane is also punted by his former coach Alex Bapela, while ex-Chiefs striker Marks Maponyane believes SuperSport United hitman Jeremy Brockie would be a force up front.